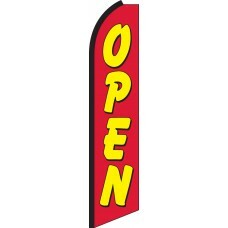 We offer many striking design choices which all feature the message, "Open." 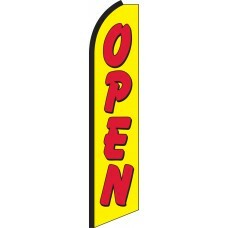 Make sure your customers know that you are open as they drive by. 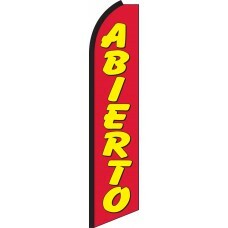 A missed opportunity is very costly and our colorful selections will ensure that your customers will know that you are open. Whether you select a Patriotic version or simply go with one of our vibrant colorful designs, these flags are winners. 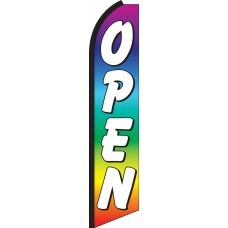 Displaying an Open Feather Flag outside your business sends a message to new and old customers that you are open and they are welcome. This is especially important if you are a new business. Perhaps your business has been under construction for a period of time and you have now opened. 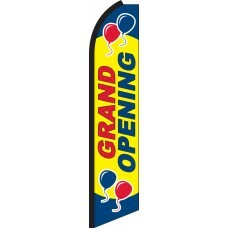 In this instance a Grand Opening or Now Open Feather Flag is a clear way to let prospective customers know that you have now opened and they are welcome. 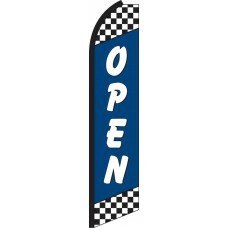 Open Swooper Flags are also great for existing businesses who have been open for a period of time. 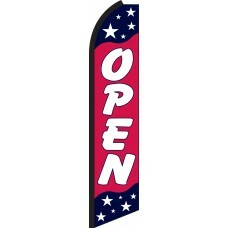 By displaying an advertising flag, customers get the sense that you are open and inviting. Sometimes customers feel intimidated by walking into a new business that they have never visited before. These flags reduce that anxiety that customers sometimes feel. Think about how many customers drive by your business every day. Displaying our advertising feather flags in front of your company helps convert people driving by into customers. If you just capture a small fraction of the traffic, our Open Feather Flags will pay for themselves in no time! 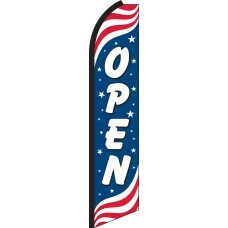 For maximum impact, display several flag sets across the front of your business.